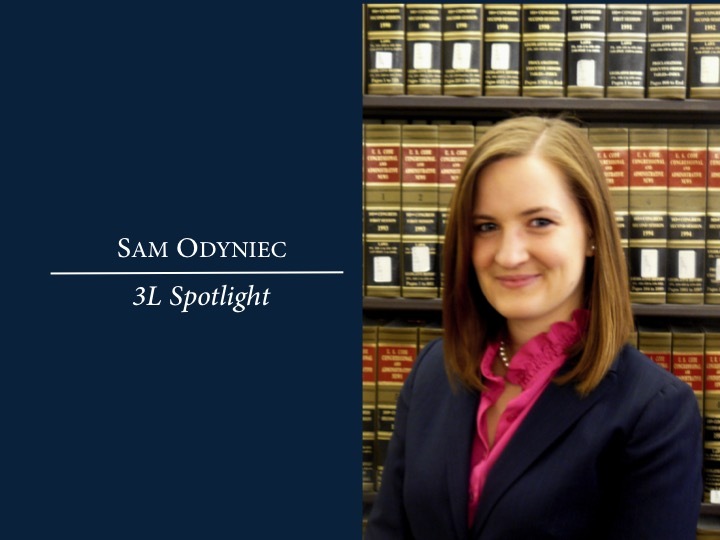 Samantha Odyniec graduated from DePaul University College of Law this May. Samantha shared with the E-Pulse her interest in Health Law, her experiences during law school, and advice for current law students. Samantha graduated from the University of Connecticut with a Bachelor of Arts in Political Science and a Minor in Human Rights. During her time at the University of Connecticut, Samantha interned for United States Congressman Joe Courtney and the Children’s Law Center of Connecticut. After graduating from UConn, she worked for the Human Services Committee of the Connecticut General Assembly and TBF Financial, LLC, where she gained valuable insight and experience. Her interest in health law first began at UConn, where she was originally a pharmacy major. Even though Samantha did not pursue a degree in pharmacy, she did come to find that she loved the policy work in the medical field. Having friends in the medical field, volunteering at hospitals and the National Institute of Health and enjoying the policy, Samantha knew that her legal career would be geared toward the Health field. As a 1L, Samantha volunteered at the Domestic Violence Courthouse Pilot Program. The summer after her 1L year, she worked in the Office of the General Counsel for DePaul University. She also stressed that the work she did while a member of the Domestic Violence Courthouse and in the Special Ad Clinic as DePaul were very influential to her. During her 2L year, Samantha was a student advocate at the Special Education Advocacy Clinic, which instrumental in her development as a future attorney. Samantha was also recognized as a 2014 Summer Scholar, for which she worked as a Law Clerk for Goldberg Law Group. This experience allowed Samantha to focus on health law litigation, her dream field. She focused primarily on physician licensing, which allowed for a more personal approach to the subject matter and help her increase her knowledge on the topic. During her last year at DePaul, Samantha worked as a Law Clerk on the product liability team at SmithAmundsen LLC, volunteered with the Staff Attorney Office for the U.S. District Court for the Northern District of Illinois and worked as a Teaching Assistant for Professor Zoë Robinson’s Torts and Constitutional Law classes. When asked about her favorite health law courses at DePaul, Samantha recommended “Medical Malpractice Survey.” She enjoyed the class because it combined her interest in litigation and in health law. Although she was not able to take the class, Samantha did express her regret at not being able to take “Health Policy and the Law.” She suggested that students try to find a variety of courses that spark their interest and to not limit themselves in course selection. Samantha recommends that students get involved in the Health Law Institute, but also with DePaul University and the Chicago community. Besides her involvement in the Health Law Institute, Samantha was also the Vice President of Finance for the Appellate Moot Court Society. During her time with Moot Court, she participated in three national competitions and received brief writing and oral advocate awards. These competitions allowed her to take on problems in a multitude of legal topics, write a persuasive appellate brief, and argue both sides of the problem in front of practicing judges, professors and attorneys. She explained that the practical experience she gained with both the Health Law Institute and the Appellate Moot Court Society helped her develop skills that will last throughout her career. Samantha plans to take the Illinois bar exam after graduation and wants to litigate in Chicago in the future. When asked her ultimate dream job, Samantha responded that she would like to litigate in a large or mid-size firm, ideally one that has a large health practice.